Prepare Ahead To Ask Questions – You have weeks to research online your condition and prepare a list of questions. The more questions you ask the better you will understand the hip replacement procedure and what it means for you. Hip Tip – How Create The Most Thorough List Of Your Questions: Leave a pen and paper in the dining, bedroom or kitchen area, or create an electronic document, whereby you keep a list of all your concerns. An easy electronic way to do this is every time you find something online, copy the URL and the related content and email it to yourself. Always use a common email subject, like ‘Hip Surgery Questions,’ so it is easy to find and sort in your inbox. Then compile all the questions before you see your orthopedic surgeon. 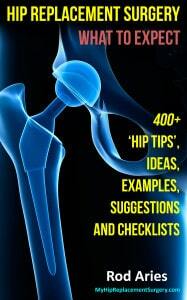 Hip Tip – Go Electronic: You can use a program like Evernote.com to capture content from hip surgery sites. You simply create a free Evernote account, then go to any page, highlight just the section you want to save and the program saves that portion – sorta like a scrapbook. You can also save to your computer using a program like Word for Windows or Google Drive. Not Only Your Questions, But Your Physician’s Questions As Well – It is important to recognize that while you will want to have your questions answered, the physician has a set of questions they need answered. Your Medical Records Are A Must – If you have medical records available to you, bring those to your initial visit. Hip Tip – Get Released: If your physician doesn’t have your complete medical records call your orthopedic office have a ‘Medical Record Release’ form sent to you. This way you can have your records sent directly to your surgeon. Insurance Information Required – Not surprisingly a hip replacement is a very expensive procedure. Bring your up-to-date insurance information and ID card. The billing department can calculate the level of your coverage and any co-payments and deductibles you will incur. Medication List – Certain prescriptions, herbal supplements and over-the-counter products may put you at greater risk during surgery. Be sure to disclose all your medications prior to surgery as some medications, such as aspirin, can thin your blood too much and pose a risk during your operation. These medications may include: Aspirin, Excedrin, Ascriptin, Ecotrin, Plavix, vitamin and herbal supplements, Coumadin or warfarin, Ibuprofen, Advil, Motrin, Nuprin, Aleve, naproxen, and naprosyn. Hip Tip – Bag It: Often it is simpler just to put all your medications into a bag and take it to your office visit. Be sure to include all your medications, including: prescription medications, over the counter medications, herbal remedies and vitamins. Also share the dosage and frequency of how often you take your meds. Hip Tip – “I Am Allergic To Surgery”: Be sure to inform your physician if you are allergic to any medications, food, latex or have any other allergies. I told my physician that I was allergic to surgery. Everybody Has An Opinion. Make Sure You Listen To Right One – Opinions are worth what you pay for them. My mother-in-law has many opinions, which are always exactly the opposite of my opinion. Of course, her opinions are worth exactly what I paid for them… nothing. You Get What You Pay For – Regarding your hip surgery, you are paying an orthopod for a professional opinion so it has value. Even though you pay for an orthopedic opinion, you may not fully understand or agree with it. If you are uncomfortable with your physician, or with the diagnosis, you can seek a second, or third, opinion. Just So It Sinks In – He then told me that should (when) I need this hip replaced again, that the revision surgery can be ‘morbid.’ Yeah, he scared me. I Was A Real Jerk – We moved 1,200 miles away and I met with a new orthopod. I laid down on the exam table, placed my foot against his shoulder and he slowly bent my knee and pushed towards my hip. After about 18” of movement, my whole body jerked from hip pain. He stopped there and said, “You are in very bad shape and we are scheduling surgery for you eight weeks from now.” I asked my new orthopod about revision surgery and he confidently said he performs revisions all the time and would do mine if that time ever presented itself. Two Sides Of The Coin – In short, I experience two orthopods with highly differing opinions on how to treat my condition. You Don’t Have To Like Your Orthopod – It is always better if your are comfortable with your orthopedic surgeon, but, realistically, it is better to have a great orthopod with an average personality that an average orthopod with a great personality. Since it is a one-time event, go with competence over likability. Diagnosis Complete – By the end of your orthopedic surgeon visit you will almost always you will receive a diagnosis whether or not you will require surgery. My Medical Condition Was A Candidate For Hip Replacement Surgery – I remember meeting with my orthopedic surgeon and receiving a physical exam and assessment. He indicated I did require a new hip and that I was way past my expiration date for my current right joint. While I wasn’t a fan of the surgical invasion, I was somewhat relieved that I had a diagnosis and I would be getting better. He indicated that the joint pain will be immediately gone after surgery as there would be no more bone-on-bone rubbing. OK, I was ready to sign up for the next available surgical slot… how about tomorrow? Alrighty… that concludes Chapter 11.